Atomic energy has had a mixed history in the half-century or so since the world's first commercial nuclear power plant opened at Calder Hall (now Sellafield) in Cumbria, England in 1956. Huge amounts of world energy have been produced from atoms ever since, but amid enormous controversy. Some people believe nuclear power is a vital way to tackle climate change; others insist it is dirty, dangerous, uneconomic, and unnecessary. Either way, it helps if you understand what nuclear energy is and how it works—so let's forget the politics for a moment and take a closer look at the science. Photo: Nuclear energy—the past or the future? Sleek modern solar panels in the foreground with the now-decommissioned Rancho Seco nuclear plant, Sacramento, California, right behind them. Will nuclear energy tide us over until we can convert the world to renewable energy? Or is it an expensive distraction? 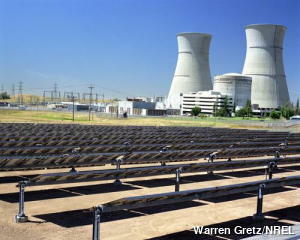 Photo by Warren Gretz courtesy of US DOE/NREL (US Department of Energy/National Renewable Energy Laboratory). 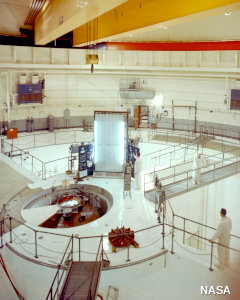 Photo: Carefully controlled: Before it was closed in the 1970s, NASA's scientific nuclear reactor at Plum Brook Station in Sandusky Ohio was used for developing materials for the space program. The site now does other kinds of cutting-edge space research. Picture courtesy of NASA Glenn Research Center (NASA-GRC). It's not immediately obvious but tall buildings store energy—potential energy. You have to work hard to lift bricks and other building materials up off the ground into the right position and, as long as they remain where you put them, they can store that energy indefinitely. But a tall, unstable building is bound to collapse sooner or later and, when it does so, the materials from which it was built come crashing back down to the ground, releasing their stored potential energy as heat, sound, and kinetic energy (the bricks could fall on your head!). Atoms (the building blocks of matter) are much the same. Some large atoms are very stable and quite happy to stay as they are pretty much forever. But other atoms exist in unstable forms called radioactive isotopes. They're the atomic equivalents of wobbly old buildings: sooner or later, they're bound to fall apart, splitting into bits like a large building tumbling to the ground and releasing energy on the way. When large atoms split into one or more smaller atoms, giving off other particles and energy in the process, we call it nuclear fission. That's because the central part of the atom (the nucleus) is what breaks up and fission is another word for splitting apart. Nuclear fission can happen spontaneously, in which we case we call it radioactive decay (the conversion of unstable, radioactive isotopes into stable atoms that aren't radioactive). It can also be made to happen on demand—which is how we get energy out of atoms in nuclear power plants. That type of fission is called a nuclear reaction. How much energy can one atom make? 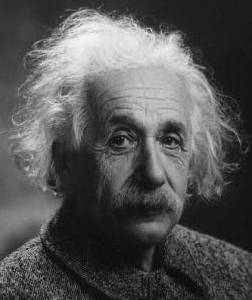 Photo: Albert Einstein—godfather of nuclear energy. Photo courtesy of US Library of Congress. If E is energy, m is mass (the scientific word for the ordinary stuff around us), and c is the speed of light, Einstein's equation says that you can turn a tiny amount of mass into a huge amount of energy. How come? Looking at the math, c is a really huge number (300,000,000) so c2 is even bigger: 90,000,000,000,000,000. That's how many joules (the standard measurement of energy) you'd get from a kilogram of mass. In theory, if you could turn about seven billion hydrogen atoms completely to energy, you'd get about one joule (that's about as much energy as a 10-watt lightbulb consumes in a tenth of a second). Remember, though, these are just ballpark, guesstimate numbers. The only point we really need to note is this: since there are billions and billions of atoms in even a tiny spec of matter, it should be possible to make lots of energy from not very much at all. That's the basic idea behind nuclear power. In practice, nuclear power plants don't work by obliterating atoms completely; instead, they split very large atoms into smaller, more tightly bound, more stable atoms. That releases energy in the process—energy we can harness. According to a basic rule of physics called the law of conservation of energy, the energy released in a nuclear fission reaction is equal to the total mass of the original atom (and all the energy holding it together) minus the total mass of the atoms it splits into (and all the energy holding them together). For a more detailed explanation of why nuclear reactions release energy, and how much they can release, see the article binding energy on Hyperphysics. Artwork: Atoms are made of protons (red), neutrons (blue), electrons (green), and energy binding them together (yellow). By splitting large unstable atoms into smaller and more stable ones, we can release some of this "binding energy." That's where nuclear power plants get their energy from. What if you could make lots of atoms split up one after another? In theory, you could get them to release a huge amount of energy. If breaking up billions of atoms sounds like a real bore (like breaking billions of eggs to make an omelet), there's one more handy thing that helps: some radioactive isotopes will go on splitting themselves automatically in what's called a chain reaction, producing power for pretty much as long as you want. Suppose you take a really heavy atom—a stable kind of uranium called uranium-235. Each of its atoms has a nucleus with 92 protons and 143 neutrons. Fire a neutron at uranium-235 and you turn it into uranium-236: an unstable version of the same atom (a radioactive isotope of uranium) with 92 protons and 144 neutrons (remember that you fired an extra one in). Uranium-236 is too unstable to hang around for long so it splits apart into two much smaller atoms, barium and krypton, releasing quite a lot of energy and firing off three spare neutrons at the same time. Now the brilliant thing is that the spare neutrons can crash into other uranium-235 atoms, making them split apart too. And when each of those atoms splits, it too will produce spare neutrons. So a single fission of a single uranium-235 atom rapidly becomes a chain reaction—a runaway, nuclear avalanche that releases a huge amount of energy in the form of heat. Photo: Chain reaction! Fire a neutron (1) at a large uranium-235 atom (2). You make an even larger, unstable radioactive isotope of uranium, uranium-236, that promptly splits into two smaller and more stable atoms krypton and barium (3). In the process, heat energy is released and there are three spare neutrons left over (4). The neutrons can go on to react with more uranium-235 atoms (5) in a hugely energetic chain reaction. Other fission reactors are possible when a neutron hits uranium-235, producing either two or four spare neutrons. That's why (confusingly) you'll sometimes read in books that uranium-235 fission produces "two or three" spare neutrons (and an average of 2.47) per reaction. What's the difference between a nuclear power plant and a nuclear bomb? In a nuclear bomb, the chain reaction isn't controlled, and that's what makes nuclear weapons so terrifyingly destructive. The entire chain reaction happens in a fraction of a second, with one splitting atom producing two, four, eight, sixteen, and so on, releasing a massive amount of energy in the blink of an eye. In nuclear power plants, the chain reactions are very carefully controlled so they proceed at a relatively slow rate, just enough to sustain themselves, releasing energy very steadily over a period of many years or decades. There is no runaway, uncontrolled chain reaction in a nuclear power plant. Can a nuclear power plant explode like a nuclear bomb? 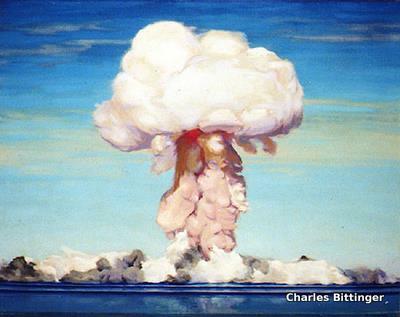 Artwork: Nuclear explosion: Oil painting of a Pacific nuclear test at Bikini Atoll in the 1950s by war artist Charles Bittinger courtesy of the US Naval History and Heritage Command, (classified as public domain). One reason many people oppose nuclear power is because they think nuclear plants are like enormous nuclear bombs, just waiting to explode and wipe out civilization. It's true that nuclear plants and nuclear bombs are both based on nuclear reactions in which atoms split apart, but that's generally where the similarity begins and ends. To start with, very different grades of uranium are used in power plants and nuclear bombs (some bombs use plutonium, but that's another story). Bombs need extremely pure (enriched) uranium-235, which is made by removing contaminants (notably another isotope of uranium, uranium-238) from naturally occurring uranium. Unless the contaminants are removed, they stop a nuclear chain reaction from occurring. Power plants can work with less purified, much more ordinary uranium providing they add another substance called a moderator. The moderator, typically made of carbon or water, effectively "converts" the less pure uranium so it will allow a chain reaction to happen. (I won't go into the details here, but it works by slowing down neutrons so they are less readily absorbed by any uranium-238 impurities and have a greater chance of causing fission in the all-important uranium-235.) All we really need to know about the moderator is that it makes a chain reaction possible in relatively impure uranium—and without it the reaction stops. So what happens if the reaction inside a power plant starts to run out of control? If that happens, so much energy is released that the reactor overheats and may even explode—but in a relatively small, entirely conventional explosion, not an apocalyptic nuclear bomb. In that situation, the moderator burns or melts, the reactor is destroyed, and the nuclear reaction stops; there is no runaway chain reaction. The worst situation is called a meltdown: the reactor melts into a liquid, producing a hot, radioactive glob that drops deep down into the ground, potentially contaminating water supplies. There are various other important differences that stop nuclear power plants from turning into nuclear bombs. In particular, nuclear bombs have to be assembled in a very precise way and detonated so that they implode (pushing the nuclear material together so it reacts properly). These conditions don't occur in a nuclear power plant. A different kind of power plant called a fast-breeder reactor works a different way, producing its own plutonium fuel in a self-sustaining process. Its chain reaction is much closer to what happens in a nuclear bomb and it doesn't work through a moderator. That's why a fast-breeder reactor could, theoretically, run out of control and cause a nuclear explosion. Photo: Nuclear nightmare: In the days following the Chernobyl nuclear power explosion in the Ukraine in 1986, a cloud of radioactive "fallout" spread throughout Europe. In this sequence of pictures, you can see the cloud (the pink area) on day 2, day 6, and day 10 after the accident. It's important to note that what happened here was a conventional explosion that threw radioactive material high into the air: it wasn't anything like a nuclear bomb. Pictures by Lawrence Livermore National Laboratory courtesy of US Department of Energy. There are plenty of people who support our use of nuclear power, and at least as many who oppose it. Supporters say it's a less environmentally destructive way of producing electrical energy because, overall, it releases fewer greenhouse emissions (less carbon dioxide gas) than burning fuels such as coal, oil, and natural gas. But opponents are concerned about the dangerous, long-lasting waste that nuclear power stations make, the way nuclear-energy byproducts help people build nuclear bombs, and the risk of catastrophic nuclear accidents. Here's a quick summary of the pros and cons. 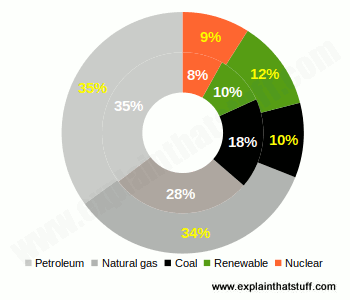 Nuclear plants produce much lower carbon emissions than fossil fuel plants (coal, oil, and natural gas). It's much more efficient to release energy by smashing atoms apart than by "burning them" (releasing energy through the chemical reaction we call combustion). That's why nuclear plants need tiny amounts of fuel (compared to fossil fuel plants). Nuclear plants can help to reduce a country's dependence on imported oil from unstable regions such as the Middle East. Countries without large fossil fuel supplies find nuclear an attractive option. Chart: Nuclear plants (orange slice) supply about 8–9 percent of the energy used in the United States (that's all energy, not just electricity). Fossil fuels (gray slices) supply 10 times more. The outer ring shows data for 2015 (white numbers), while the inner ring shows 2017 data (yellow numbers), so you can see there's a very slow shift away from fossil fuels (coal in particular) to nuclear and renewables. Each fuel percentage is rounded so the total may not add to exactly 100%. Source: Energy Information Administration, US Department of Energy. Waste from nuclear plants remains dangerously radioactive for many years, so it's difficult to dispose of safely. Nuclear byproducts can be used to make bombs and there's a risk of nuclear material being acquired by terrorists. Nuclear plants aren't sustainable or renewable forms of energy, because they rely on mining limited reserves of uranium. They're not zero-carbon either, because it takes a lot of energy to mine that uranium. Nuclear plants are expensive and take many years to construct, usually in the face of fierce public opposition. Nuclear plants can produce long-range air pollution and water pollution. Since nuclear plants need huge amounts of cooling water, they're often built by the coast—but that makes them dangerously susceptible to rising sea levels and earthquake tsunamis. At the end of their life, nuclear plants are very expensive to decommission safely. What do you think? Do the advantages outweigh the disadvantages? Decommissioning nuclear reactors is a long-term and costly process: It can take several decades and up to a billion dollars to clean up a nuclear plant. A fascinating article from the US Energy Information's Today in Energy blog, November 17, 2017. The world's largest nuclear plants differ by age, number of reactors, and utilization: A good summary of the current state of world nuclear power from the US Energy Information's Today in Energy blog, February 6, 2017. Nuclear power stations and reactors operational around the world: listed and mapped: Where are all the world's nuclear power plants? What type of reactor do they use? When were they first opened? This March 2011 article from The Guardian presents a list of all the world's (non-scientific) reactors and plots them on a Google Map. Nuclear Reactors and Nuclear Bombs: What Defines the Differences? : PBS Newshour, April 6, 2011. Explains the differences in the uranium fuel used by reactors and bombs. Hyperphysics: Nuclear: A series of good, short introductions to nuclear physics and its various applications. A Bittersweet Milestone for the World's Safest Nuclear Reactors by Peter Fairley. IEEE Spectrum, September 20, 2017. A look at new Westinghouse AP1000 reactors currently being built in China. The Murky Future of Nuclear Power in the United States by Diane Cardwell. The New York Times. February 18, 2017. Safety concerns have prevented nuclear power from ever becoming cost-effective. Amid a Graying Fleet of Nuclear Plants, a Hunt for Solutions by Henry Fountain. The New York Times. March 21, 2016. Is it possible to build a new generation of nuclear plants before our current plants reach the end of their lives? The Forgotten History of Small Nuclear Reactors by M.V. Ramana. IEEE Spectrum. April 27, 2015. Do nuclear power plants necessarily have to be so big and expensive? Nuclear Power: Go Big or Go Home by Dave Levitan. IEEE Spectrum, September 19, 2012. Nuclear power is on the rise in some countries and on the fall elsewhere, so what's the picture overall? The Future of Nuclear Power: Governments around the world are rethinking nuclear energy by Steven Cherry. IEEE Spectrum, March 23, 2011. How Japan's Fukushima nuclear disaster brought nuclear power to a screeching halt. It's relatively easy to find books and websites that are stridently pro- or anti- nuclear power—so I've left those off my reading list. The ones listed here try to be more neutral, hopefully more objective and educational, and present a fairly balanced mixture of the various arguments based on science and evidence. Don't let people tell you what to think: learn the science—and make up your own mind! Nuclear Power: A Very Short Introduction by Maxwell Irvine. Oxford University Press, 2011. A slim (144-page) volume designed to cut through the heated arguments about nuclear power. Nuclear Energy What Everyone Needs to Know by Charles Ferguson. Oxford University Press, 2011. A well-informed, accessible, and reasonably balanced introduction presented in a kind of "frequently asked questions" (FAQ) format. Nuclear Or Not? : Does Nuclear Power Have a Place in a Sustainable Energy Future? by Prof. David Elliott (ed). Palgrave Macmillan, 2009. An objective review of the arguments for and against nuclear power, presented in a series of essays. Nuclear? : In this chapter from his book Sustainable Energy Without the Hot Air (UIT Cambridge, 2009), physicist David MacKay considers how nuclear power stacks up as a sustainable power source. Physics for Future Presidents by Richard Muller. New York, W.W. Norton, 2008. Quite a lot of Richard Muller's excellent book is devoted to different nuclear topics, from weapons and waste to fission and fusion. Although pro-nuclear, it sets out its arguments in a very measured way and you can take them or leave them. There is a very good assessment of whether nuclear energy and waste is as dangerous as some people think when you consider other types of risks. Nuclear Power: Is it too risky? by Jim Pipe. Franklin Watts, 2010. A short (32-page) book with arguments for and against all the different types of energy, including nuclear, presented side by side. 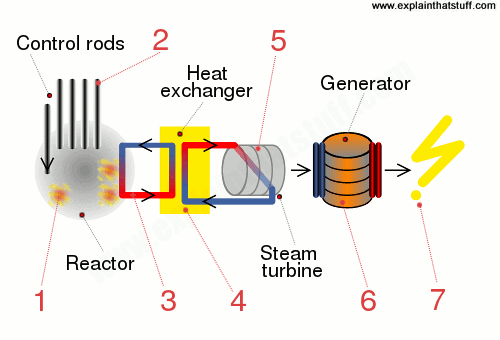 Nuclear Power: Energy Debate by Ewan Mcleish. Wayland, 2009. A short (48-page) library-style volume presenting another balanced look at the pros and cons of nuclear power. Energy by Chris Woodford. New York/London, England: Dorling Kindersley, 2007: This is my own very colorful little introduction to the world of energy for ages 9-12 or so. Nuclear is considered as one of many different types of energy. Power and Energy by Chris Woodford. New York: Facts on File, 2004. Another one of my energy books. This is a more detailed and more wordy one suitable for ages from about 10–16, and with more emphasis on how humans have harnessed different energy sources through the ages.